the indispensable resource just got a whole lot better. The folks over at Waterway Guide, who have been publishing this indispensable guide to cruising for 65 years as of 2012, have been busy in the past couple of years. Under new ownership, they undertook several massive projects, including introducing a fourth edition that covers the Great Lakes and Great Loop, updating the Mid-Atlantic, Northern, and Southern editions for 2007, and completely redesigning the format for all the editions as each of the updates rolls off the presses. The number of changes in each edition is staggering. Moreover, the format changes include adding aerial photography, expanded navigational coverage, more detailed marina listings, enhanced bridge tables, GPS waypoints, distance charts and planning maps. Even the paper and printing seem to be of higher quality (our prior edition is so dog eared and ripped from overuse that we cannot wait to put a new one aboard to see if it stands up to our loving abuse)! The Southern Edition is said to have much-expanded coverage of the Bahamas, which the snowbirds will love for their next flight in either direction. We haven't seen that edition yet, but really look forward to reviewing it in detail. If you visit their website, you'll note several collections of useful links pages, including a complete listing of marinas - it is however alphabetized and not searchable by region, so you'll have to know what you're looking for. More importantly, they maintain a navigational updates page, which includes regional notices to mariners. The Guides retail for $39.95 via their website with free standard shipping. Helloooo, not everyone dreams of sailing off to Bora Bora. Lots of people spend their waking hours dreaming of what to do next weekend in their own local cruising waters. 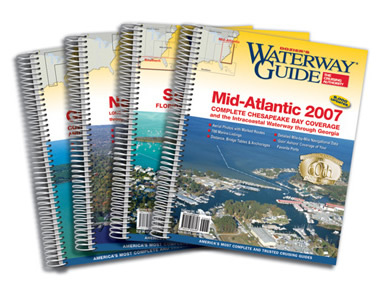 Along comes the Waterway Guide Magazine, which picks up where the Guides leave off. The Guides provide static information about how to get there, where to tie up, what to do ashore in general terms that last an entire season. The intent of the magazine is to take it from there to what's happening ashore, providing more details about people, events, and things to do than you can cover in a templated guide. Feature articles on favorite waterfront destinations. What to do, where to do it and how to do it, focusing on events, towns, ports, marinas, boats, products and other subjects. Little-known facts on things to see along the way. How-to information to solve situations cruisers encounter along the waterways. Entertaining accounts from readers about their waterway adventures. Ideas for entertaining and cooking aboard. Product reviews from actual users. Much more to help cruisers plan and get the most out of boating on the waterways and coast. The magazine was launched in December along with the updated 2007 editions of the Guides. It is currently scheduled for quarterly publication and they are looking for people who can contribute local knowledge and content. We'll be curious to see how future issues unfold, the first one having produced a rather ambitious edition with a neat - though not comprehensive - guide to marinas along the east coast at the end. We'll be interested in seeing how they satisfy regional interests of boaters with a national reach, yet we wish them great success with a publication that fills a need - providing local knowledge (sort of what CoastalBoating.net does!). In fact, we wouldn't be surprised if their next move is to split it into four regional editions aligned with the guides!